Having recently arrived among the top 40 on Coinmarketcap.com, Metal is not exactly the best kept secret in crypto any more, but it still seems to be flying under the radar. With the release of its alpha platform on October 30, however, Metal is not going to be a secret to anyone much longer. Metal is a mobile payments processing platform that will support fiat currencies alongside crypto coins and tokens. Metal combines the commercial functions of a platform like Paypal, Square, or Venmo with the crypto dexterity and ease of use of a wallet like Exodus, and has added a slew of incentives to drive adoption among customers and merchants alike. The platform aims to overcome some major barriers that have so far hindered the widespread adoption of crypto for everyday use. These include a steep learning curve and general security angst among non-technical people; unwelcoming user interfaces (UX/UI); and a lack of convincing incentives, beyond coolness, for people to use crypto as a means of exchange. No doubt many potential users have also been put off by concerns around price stability, liquidity, and uncertainties of regulatory and tax status. Metal’s intent is to make it easy for anyone to conduct transactions in crypto (#grandmaproofing is a thing here). Screen shots of the UI, shared by alpha reviewers, show a sleek and seemingly familiar platform, in which wallets look pretty much like debit cards on the screen. (You can see it in GIF on Twitter.) 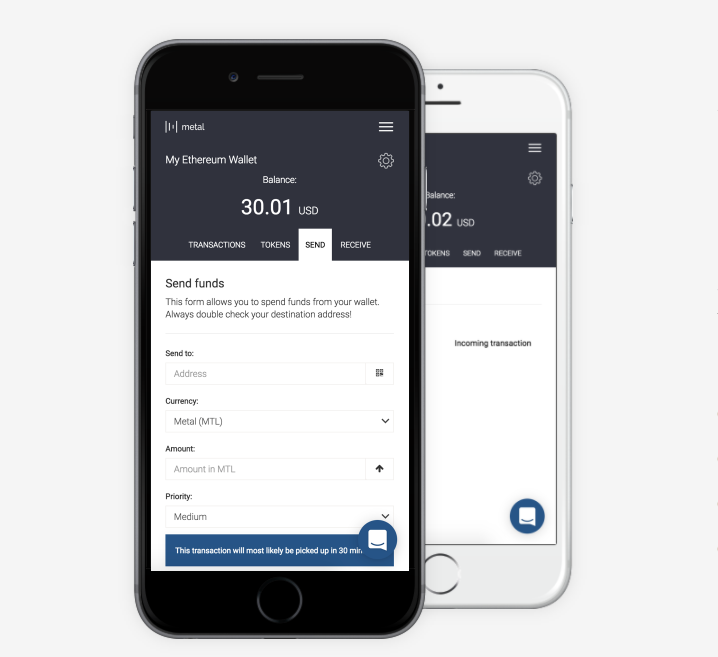 The web-based alpha to be released on Monday – codenamed “Vault” – provides a first taste of Metal, as a secure wallet supporting Bitcoin, Ethereum and a starter group of over twenty ERC20 tokens, along with hardware wallets (Trezor and Ledger). The beta version, which the team hopes to release by the end of the year, will go much further, supporting fiat to Metal purchases and introducing Metal’s unique token distribution mechanism, “Proof of Processed Payments” (PoPP). Android and iOS support will be brought in before long, and the full platform will offer users an FDIC insured fiat account (with standard features like cheques and a debit card) that is fully integrated with the multi-coin crypto wallet. US dollars will be the first fiat supported, to be followed by the UK and New Zealand markets. Users will be able to move funds from fiat to crypto and back, to conduct crypto transactions with only a phone number, and to earn a form of cash back (through PoPP) with every purchase on the platform. For merchants, Metal will provide a convenient payment facility to enable invoicing and receipts in the supported currencies. Point-of-sale transactions via crypto will help to keep fees low, while merchants can still use the platform to convert funds to their fiat account. Metal has initially aimed at under-banked industries including nutraceuticals, adult entertainment, and cannabis, which is among the fastest growing commercial sectors in the US today. While fully legal, these businesses often can’t obtain electronic payment and banking services, or face outrageous fees, due to stigma and perceived risk. Metal’s solution is to “bank them on the blockchain”, and to make doing so affordable, easy, and secure. Metal will not provide the anonymity of cash, since users need to be identifiable under Know Your Customer (KYC) regulations. The KYC process will help ensure the platform is not used in fraud or other illegal ventures, and will also prevent gamers and bots from undermining the PoPP. The multi-currency mobile payment platform and appealing UI are the core of Metal’s platform, and already stand apart from anything else in the crypto space at this point. But PoPP adds a novel layer of incentives to attract new users to the platform. PoPP is like a cash-back mechanism which pays users with the native token, MTL, when they use the platform. Users earn a 5% top-up when they convert fiat to crypto on the platform, and also when they pay for goods or services. Merchants earn another 5% from each transaction they invoice and receive through the platform. KYC and custom anti-fraud algorithms will ensure that individual users can’t receive more than a maximum $1000/month via PoPP, while merchants will be limited to $5000/month – helping ensure a broad distribution of the PoPPed MTL tokens. MTL is on the Ethereum blockchain (using Ethash as its Proof-of-Work for security), and with a finite number of tokens there is no mining as such. But with almost 40% of the total issue reserved for the PoPP, early users will be effectively mining as they transact on the platform, for as long as the PoPP reserve lasts. For these users, it’s like free money. And when all these MTL are distributed, well, that’s all there is. “You should be getting paid to use money – which is kind of a new concept, but that’s what we’re doing.” — Marshall Hayner, CEO of Metal. If the platform averaged $1 billion per year of transactions, the PoPP would last about 2.5 years – if the price of MTL stays around $10. If it sees more volume, the PoPP could be eaten up more quickly. But then again, as the use of MTL increases, so too will demand for the token; the HODL factor will tend toward scarcity, which could offset the addition of coins. And as the token price increases, PoPP will last longer because each token will go further. If token demand falls, however, both the PoPP and the growth prospects could be in jeopardy. But POPP has a good chance of attracting merchants, since the 5% bonus is only earned when they use the Metal platform to receive payments. This MTL can then be used to offset the fees charged on the transactions. Additional fee reductions will be given to merchants who offer discounts to customers when they use MTL. And MTL-MTL fees will be minimal, enabling savings that can be shared by both parties. All said, that’s a lot of incentives to encourage use of both the platform and the token, and will surely attract a lot of new users to crypto. Metal’s affable CEO, Marshal Hayner, has clearly been thinking about the project for some time. As head of Trees, a cannabis startup in Oakland, California, he grew concerned about the lack of banking services for an industry that was closing in on $10 Billion per year in sales, and began to look to Bitcoin and the blockchain as a possible solution for these and other cash-based businesses. He has been focused on Metal for over a year, but it was only in June that the parent company, Metallicus Inc., filed for trademarks on MTL and PoPP. Marshall has been talking up the platform at conferences and on social media, and has clearly had a good picture, for some months at least, of what the final product would aim to do. Code for the platform was largely derived from Open Zeppelin and audited by Zeppelin Solutions, which commended the team for “writing very minimal code and reusing existing contract modules”. A closed alpha version has been doing the rounds among some 50 testers since early September, and the team is confident it’s worked out most of the bugs. On October 7 Metal committed to publicly releasing the alpha, which is being subjected to a rigorous third-party security audit, on October 30. Marshall has gathered a team of stellar proportions for this project. He co-founded Metal with Glenn Marien (DogeChain.info, Fonego), who remains CTO; Sid Parihar, a lead designer with Apple for some 7 years, is heading UI/UX and philosophizing about branding and trust; Oscar Munoz (VISA, AmEx) is handling compliance and regulatory issues; and Brock Nordstrum is working on motion design. Metal’s September update announced the arrival of iOS developers Kenan Pulak and Ephraim Russo, who are readying the iOS platform. Advisers include Bram Cohen (creator of BitTorrent), Vinny Lingham (Civic), Andrew Lee (Purse) and Jason King (Alphabit), with early investors Erik Voorhees, Ben Nguyen Tang Le, and Mario Pazos, along with G2 Ventures, Gateway and Alphabit. While not an official advisor or an investor (“yet”, says Hayner), Sir Richard Branson (Virgin) is generally understood to be a fan of the project. In fact, Branson’s annual charitable tennis tournament and auction, the Necker Cup, is being sponsored by the Metal Foundation this year. The Foundation was endowed with 2,000,000 MTL to help it “bring awareness to great causes while exposing many to MTL and the supported cryptocurrencies on the Metal Wallet for years to come.” The cause, in this case, is relief in the British Virgin Islands from the devastating 2017 hurricane season. And true to Metal’s form, the exposure is not wide, but it may well be deep. Metal’s use of the blockchain to enable consumers and merchants to bypass banks is especially critical for industries in which cash predominates. These include, as mentioned, cannabis, nutraceuticals, and adult entertainment, but also e-sports, and some parts of the food industry like restaurants. In an increasingly cashless society, an inability to take digital payment can cost businesses a lot. By enabling mobile transactions among fiat and crypto, Metal enables these businesses to broaden their customer base and removes layers of security and handling issues. And since it’s awfully tough to conduct business over the internet in cash, Metal will allow many merchants to move into e-commerce. But Metal is entering a rapidly filling space around crypto transactions, and because of its scope, inevitably bumps up against a lot of potential competitors. Metal provides the services of a payment processor (Paypal, Venmo), a crypto entry point (Coinbase), a multi-token wallet (MEW, Exodus) and the ability to make mobile VISA-based payments with crypto (TenX, and then some). Metal aims to deliver all these functions through a single platform, though, so it is hard to look at any of these companies as direct competitors. Nonetheless, providing a superior product does not guarantee success, and much rests on whether the PoPP is a powerful enough incentive to bring a critical mass of newcomers to the platform. Much also depends on marketing, and Metal’s current word-of-mouth approach likely needs some help if the product is going to grow to its potential. So at this point investors may still see some challenges. The lack of a public roadmap, for one, leaves uncertainty around the project’s goals and timelines. (Metal prefers to roll out its plans and upgrades when they are ready, rather than on a schedule; the October 30 release date is not lightly delivered.) Metal’s white paper, too, has drawn criticism, as it left many questions unresolved, making it hard to think through how the platform, and especially PoPP, will impact long-term demand for the MTL token. It was also released with less than a stellar proofreading, which leaves an unhappy impression. An updated whitepaper is roundly anticipated, possibly right alongside the alpha release, and this should shed more light on the details of the PoPP rules, merchant fees and discounts, and may provide some kind of roadmap regarding release plans and currency support. A lot of information has been shared by the CEO and team in various interviews and especially on Slack, but it would be helpful to have it all together in a reference document. Investors can purchase MTL on a number of exchanges, including Cryptopia, Bittrex, Changelly, Shapeshift and (most recently) Binance. Through October the token has traded between $5.50 and $10 US, after reaching a high of over $13 in early September. Market cap as of writing (Oct. 28) is $172 M USD, putting it at number 34 on coinmarketcap. 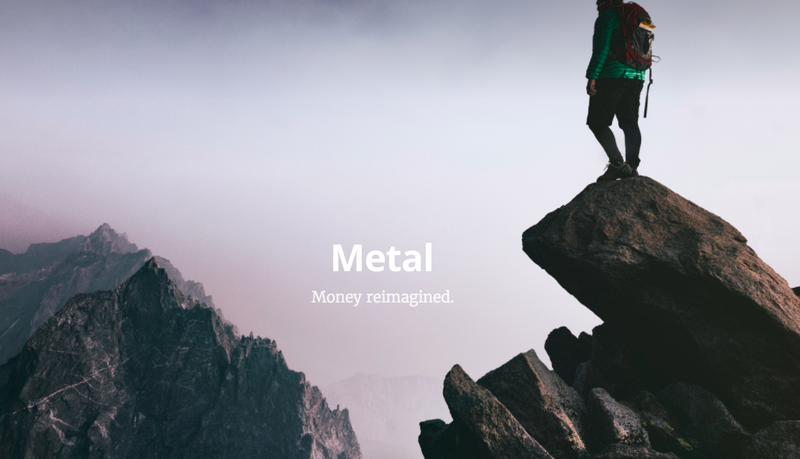 With the public release, the Necker Cup, and ongoing appearances (like the 7th Future of Money & Technology Summit 2017 in San Francisco on December 4), Metal seems about ready to burst from its shell. It still has a ways to go, but barring a disappointing alpha or serious problems with subsequent upgrades, Metal seems likely to move up the ranks in coming months. Disclaimer: The author holds a modest investment in the MTL token. He is not an employee or contractor of Metal Pay, Metallicus Inc., or any affiliates. The above review does not constitute investment advice.